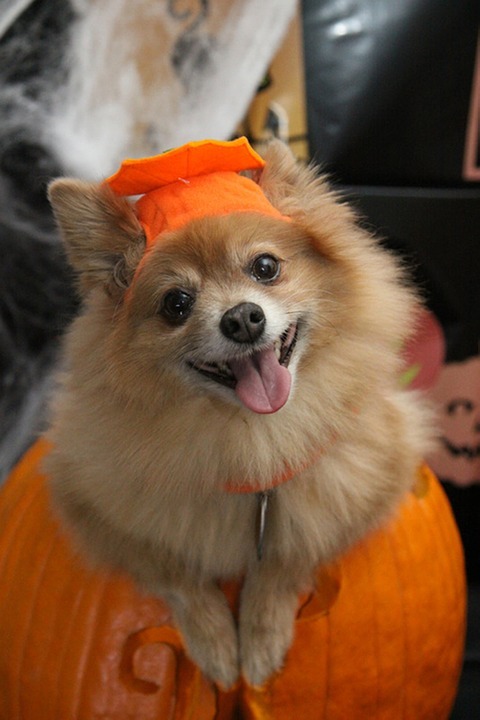 With Halloween just around the corner, it’s time to think about the best ways to keep your pets safe and happy, especially if he’s nervous around strangers. For many families, this time of year is one of the most fun, with pumpkin patch afternoons and evenings by the fire with a mug of hot cider. When it’s time for trick-or-treating, it’s important to keep in mind that many pets who may ordinarily be very outgoing can become nervous or anxious when lots of new people are walking through the neighborhood, and costumes with masks might be confusing or scary. If the evening will be too much for your pet, consider letting him hang out in a kennel or in a room away from windows and doors, or ask a friend or family member to spend some time with him to help him stay calm. While some people allow their dogs to sit outside during this time, it might be a good idea to let him stay in the house, away from the crowd. It can be helpful to pull up a chair for yourself, however, and hand out candy on the porch or on the front lawn, as this keeps trick-or-treaters from coming up and ringing the doorbell. Candy is another concern for pets, especially dogs. If your pup is curious about people-food, keep the Halloween treats in a bowl with a lid on a high space so he can’t get to them. Be sure to talk to your family members, especially young children, about not giving the dog any candy and let them know that chocolate is dangerous for dogs. If you believe your dog has ingested chocolate or any other candy, call the ASPCA Poison Control Center right away at 1-(888)-426-4435. For a list of symptoms your pet may exhibit after ingesting chocolate, read Rover’s helpful guide. When it comes to pet costumes, it’s important to think of them the same way you would think of an outfit you’re putting on a small child. Does it restrict movement or breathing? Are there small buttons or threads that could present choking hazards if chewed off? Are there elements that could choke your pet if the costume gets caught on something? It’s generally a good idea to try on any costumes for your pet before the big night to make sure it fits well and that he will tolerate having it on. Remember not to force anything, as this will make for a pretty unhappy pup. One of the most dangerous aspects about Halloween for pets is something that many of us enjoy without much thought: candlelight. Most jack-o-lanterns have candles inside them, and many homeowners use them to illuminate walkways and foyers for a creepy atmosphere. For pets, however, this lovely lighting can be a problem if they walk too close or accidentally knock it over, so be sure you keep open flames up and out of the way of your pet. For more potential hazards, read on here. If you own a cat - especially a black cat - and he spends time outside, consider keeping him in for the week of Halloween. Kitties - even those with collars--are often targets for well-meaning kids who want a classic Halloween cat to take home, or pranksters who have a more sinister agenda in mind. It’s also a good idea to keep fall plants out of your pet’s reach. They may look harmless, but many types of plants are either poisonous or simply create gastrointestinal problems for dogs. Keep your pup safe by putting any item you’re unsure about up off the floor. Halloween is a fun time of year, and your pet can join in as long as you have a good plan in place for keeping him safe. Make sure he has a collar with an updated ID tag on it at all times; even if he’s an indoor pet, the barrage of trick-or-treaters may create a distraction that allows him to escape. With a little preparation, you and your pet can have a great Halloween.